The YMCA of the Greater Twin Cities (YGTC), a leading nonprofit dedicated to strengthening communities through youth development, healthy living and social responsibility, helps motivate and inspire children to learn by offering meaningful before and after school activities where they can boost their academic success. The Y’s Before and After School Program combines academics with play and offers a caring and safe environment for children who would otherwise be left unsupervised. During the school year, 15.1 million children nationwide, and 294,354 children in Minnesota alone, do not have access to before and after school programs and are left unsupervised after 3 p.m., according to the Afterschool Alliance, a nonprofit public awareness advocacy organization. With the start of the new school year, the YGTC encourages parents/caregivers to make sure that their children are involved in safe, educational experiences before and after school. Studies show participation in before and after school programs helps boost school attendance and academic performance and reduces gaps in academic achievement among children from disadvantaged households. The YGTC partners with school districts such as Eden Prairie, Eagan, Mounds View and Shakopee as well as private schools in the community to offer educational programming. 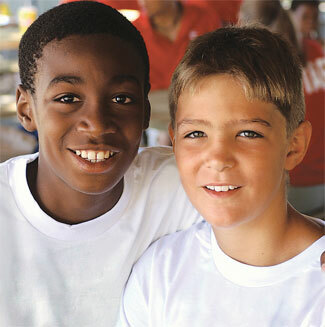 In addition, the YGTC has academic success and child development programs in communities where there is a strong need. There are teen volunteers who help in these community outreach programs and gain leadership skills and confidence in working with children. Listen to Nastaran and Soraya’s Story and discover how the Minnetonka Heights program has made a positive impact on their lives. As a leading nonprofit committed to nurturing the potential of youth, financial assistance is available to those in need to ensure every child and teen has the opportunity to learn and grow at the Y. Learn more about the YGTC’s youth programs.